Juicing allows you to eat more of certain foods you would otherwise have difficulty eating in significant quantity. For example, it's more appealing to drink several bunches of parsley in a glass than to eat them whole. 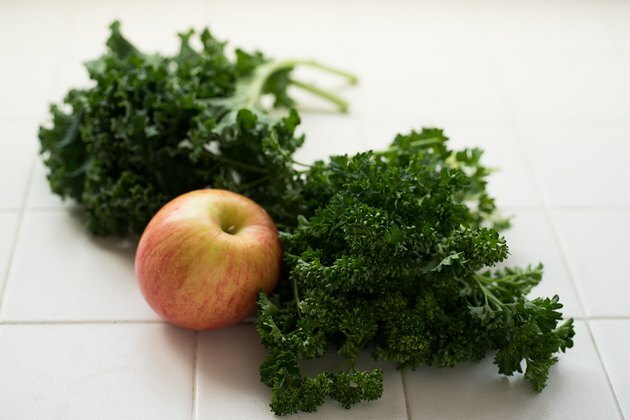 You do lose fiber when you use a juicer, which extracts the pulp. Parsley juice is a rich source of chlorophyll, an antioxidant compound that gives parsley its green color and that may provide defense against free radicals and may help fight certain cancers. Parsley juice is also a good source of other phytochemicals, vitamins and minerals. Cut off the stem tips just below the rubber band of the parsley bundles with a sharp knife. Fill a large bowl with cold water, then submerge the bundles, one at a time. Move them around slowly in the water, then lift them out. 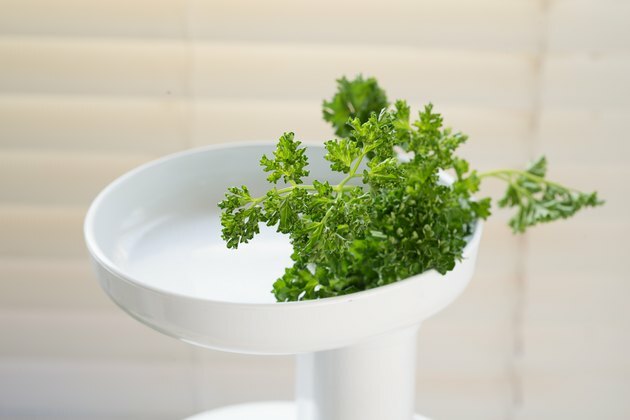 Pour out the water -- not over the parsley, or you might return the dirt into the bundle -- and refill the bowl. Repeat until you don't see any dirt or debris in the bowl. Wash, peel, de-seed, chop and otherwise prepare any other fruits, vegetables and herbs you're including in the juice. Unwrap a bundle of parsley and place it into the juicing compartment of the juicer, along with a portion of the other fruits, vegetables and herbs you're including. Operate the machine as instructed, whether you have a fully automated model that just needs to have a function set and be turned on or you need to manually press down on a plunger. Repeat until you've extracted the desired amount of juice. Detach the juice compartment and pour the contents into a glass. 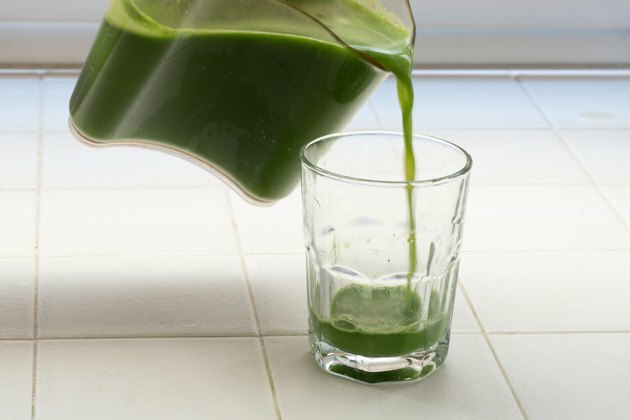 Parsley juice tastes best fresh -- preferably within minutes of being made. If you make extra, store it in the refrigerator in an airtight glass container for up to 24 hours, but be prepared for diminished quality. 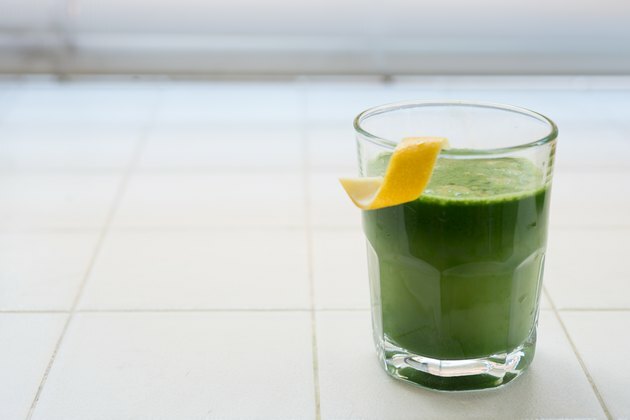 Kale, spinach, apples, carrots, ginger, lemon and cilantro all make good additions for a more flavorful and nutritious parsley juice. Don't try to juice items with a low water content, like avocados. Instead, puree them in a food processor or blender. Then, pour in the parsley juice and blend.